Hello friends, it's a 5th Friday of the month and that means the team at A Vintage Journey are sharing tags they have made just for fun. I am heavily into junk journaling at the moment, so I created a tag that could be incorporated into my journal. I'll give you a brief run down how I went about making my tag and then I'll show you how it fits into my journal. So I started with a cast off tag after a session playing with my geli plate. I added some distress oxides using mostly blue tones and then did a few sprays with Distress Spray in Ground Espresso. It was a bit too dark for my liking so I stamped a text background stamp in embossing ink and then embossed with Wow Opaque White EP. I added some collage elements until I was happy with the way it looked, using some tea-dyed paper, ephemera scraps, washi tape a paper doll etc. Below a few close ups, I think this style works best if you layers several layers of paper and tape over each other. I also rolled up some scraps of ephemera for the gypsy lady to sit on, I propped her up on the back with some bits of waste board. I finished the back off also, as the tag will be fitted into my journal with washi, so both sides can be used and seen. And here you can see how the tag fits into my Midori size journal. I call it my everyday journal, as I journal in it on most days. The journal itself was decorated with more washi. Oh and if you are wondering, I always put a layer of clear gesso over my washi tapes, that way you can both stamp and stencil over it, and write on it easier too. Here is the back with the right side page of the journal. Alright, that's it for today, Thanks for dropping by and if you have not been yet, do check out the tags my teamies have created, plenty of inspiration there. All you need to do is CLICK HERE. 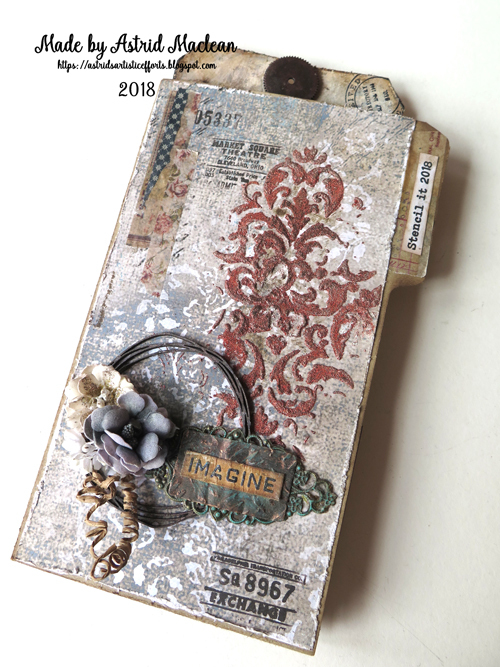 This one is a size 8 tag that I ran through one of Tim Holtz's 3D folders. Next I coloured it with a mix of Distress Oxides and normal distress inks and to give it a bit more definition I then added just one spritz of Distress Spray in Ground Espresso. I then took one of the paper dolls, paper pieced a hat and some wings on him and collaged him onto the tag in addition to some strips of washi tape. The final step was to add some shadow around him with a Stabilo All pencil. The background to tag number two was created with the help of Distress paint, gesso, background stamping and stencilling with archival ink in Hickory Smoke. The girl is a Paper Whimsy image that again I gave some wings and collaged onto the tag together with some fussy cut roses from one of the Prima collections plus some more washi tapes etc. Tag number 3 again was run through a Tim 3D embossing folder, coloured with Antique Linen and Vintage Photo Distress ink and some Distress Spray spritzt through a stencil. The little girl is of course another paper doll and the other collage elements were either stamped or cut from Tim Holtz paper collections. The final tag is a size 10 tag. I started by stencilling with some Decoart Crackle paint. When it had crackled I added colour with Antique Linen Distress Paint, some Vintage Photo Distress Spray, some Decoart Antiquing Cream and some Ground Espresso Distress Crayon. I did some stamping around the edges and then finished it off with yet another paper doll and a couple of Tim die cuts plus some other bits and pieces from my collage box. I love the effect of the crackle paste through the stencil. The darker shadows around the boy were created with the help of a brush dipped into the Ground Espresso spray bottle. Well, that's it for today. I hope I have not upset anyone with my political ramble, I know I have quite a few American visitors and I firmly believe everyone should be allowed to their own opinion, so if some of you feel that what Trump did was right, I won't hold it against you. All done in a very similar way. But the real reason I am posting here is because I have found a solution to the problem of not receiving comments left on your blog in your email. Please share if you have other friends/Design Teams where this issue has been a problem. Hope life is treating you well! It's been rather quiet here, for two reasons, - one I've been busy with other things as you will see in a moment, but also, I have become rather tired of blogger and blogging to be honest. It really annoys me they have still not fixed the issue with comments no longer getting into our inbox, but also, writing a blog post takes so long... I much rather spent my time creating. And for sharing creations and getting inspiration from others? Well I thoroughly dislike Facebook even more, but I have recently grown to LOVE Instagram, which was the starting point really of today's post. I have been hugely inspired by some of the amazing Instagram accounts with wonderful examples of mail art, pen-pal creations, travel journals etc etc. Each envelope had a piece of tea dyed and hand stamped paper. A little booklet like this, with two little pockets inside to hold some washi tapes. A little bag, either from clear Glasine or Kraft Glasine paper (the stuff Tim Holtz brought out years ago and was hiding in my stash). Each little bag was filled with a collection of home made stickers, real and home made postage stamps, little tags and some wax seals, another new passion of mine.....(making them that is). And finally a little blank greeting card with a home made stamp of sorts they can use either as a keepsake or send on to others. And Frilly and Funkie, where the theme is By Airmail. The theme was just so perfect for this and a lot of these envies actually went by airmail! Well, that's it for now, thank you for taking the time to visit, have a great week and I would love to know your thoughts on the different social media platforms such as blogger, Facebook and Instagram. Hello lovely visitors, thanks for dropping in. Hello friends and thanks for taking the time to drop in! Today I have a project to share using one of my all time favourite paper collections, Alchemy, from Stamperia. It's yet another altered file folder, I love making these. This one is meant for a friend I am going to see later today, so fingers crossed she will like it. The front is decorated using some stencils, some dry embossed bits, a cut out from the paper collection and a little metal charm. I think the stencil is from Kaisercraft, I stencilled with texture paste and then sprinkle Seth Apter's Patina Oxide powder into the wet paste and then heat set it. I then highlighted it all a bit with a Cracked Pistachio Distress Crayon. The words were stencilled just with the Distress Crayon and all the other elements were highlighted with Treasure Gold in Copper. Here is the first double page and pockets, almost entirely decorated with fussy cut elements from the collection. There are two double pages in this booklet, so this is the second one. Inside that pocket is a little folded card that has one of several quotes I added to the booklet. All the quotes are from Paulo Coelho's book The Alchemist, one of my favourite books of all time. The next pocket holds a slightly larger folded card with another quote inside. The next pocket holds a larger card with a quote on the back side of it. I embossed the edge of it with a mix of the Patina Oxide and Rust Baked Texture powders, just to make it stand out a bit. The booklet closes with the simplest of closures, just a little clip to which I attached a couple of charms, and that was pretty much it.